What steps have been taken to achieve its successful, contemporary operations? T.O.M. BV believes in combining various purchasing and sales channels. With this strategy, we strengthen the various divisions within the company. As a result, T.O.M. BV is more than just a retailer: we are also a wholesaler and supplier for shops and webshops in 27 European countries. The entire range is offered and sold on our seven webshops and in the physical store. We also collaborate with well-known national and international marketplaces, so that we have a reach of millions of potential customers per day. There is more about that later in this brochure. 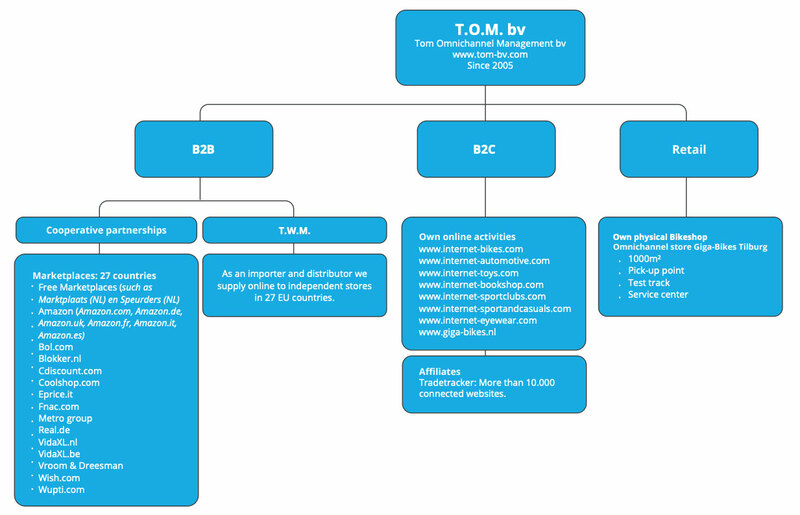 The organizational chart below shows how the divisions of T.O.M. BV are classified. What can T.O.M. BV do for your company? Curious about what we can do for you as an organization? We are happy to tell you! A key characteristic of T.O.M. BV is that we prioritize the various unique selling points within the company. These USPs indicate where the strengths lie within T.O.M. 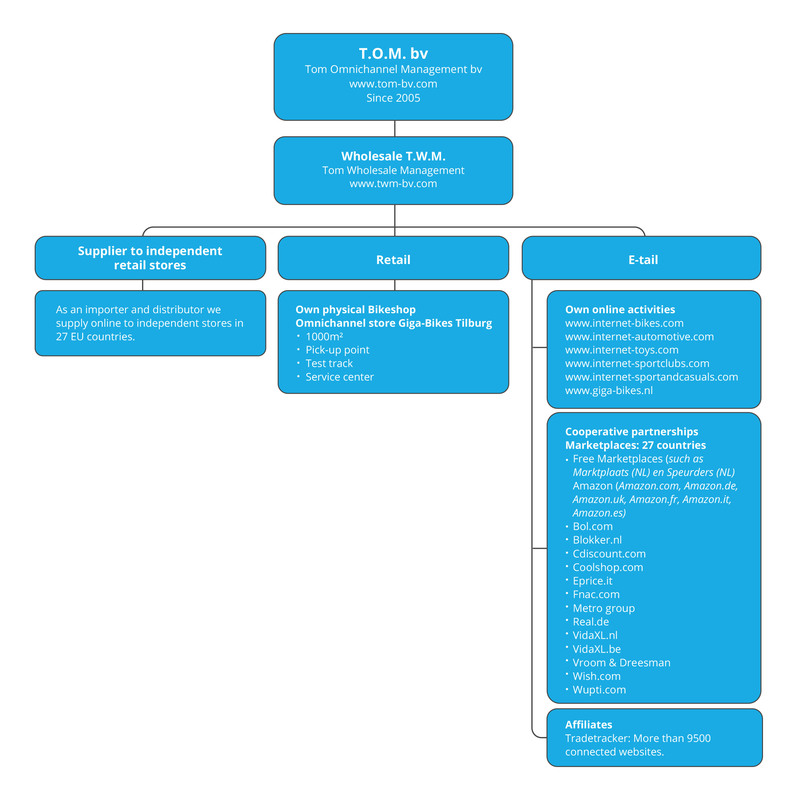 BV and how we are a successful addition to your organization. T.O.M. BV is a family company pur sang, with a heart for the business and with a heart for the people. At T.O.M. BV, every employee is equal, with or without an employment challenge. 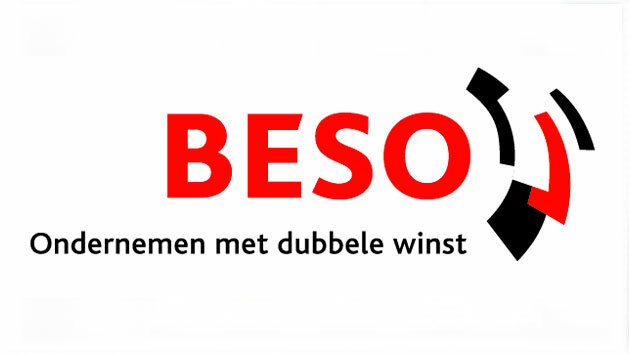 In 2014, we proudly took second place during the BESO elections for ‘Brabant employer with a social heart’. Since 2008, T.O.M. 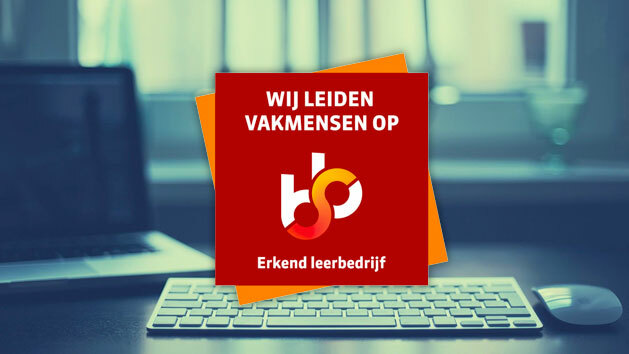 BV has been an officially recognized training company of the Samenwerkings Onderwijs Bedrijfsleven (‘Collaboration of Education and Business’; SBB). By working as a training company, we encourage students to gain practical experience and introduce the new generation of professionals to e-commerce at T.O.M. BV. In addition, the current employees are encouraged and facilitated in continuing their education. T.O.M. 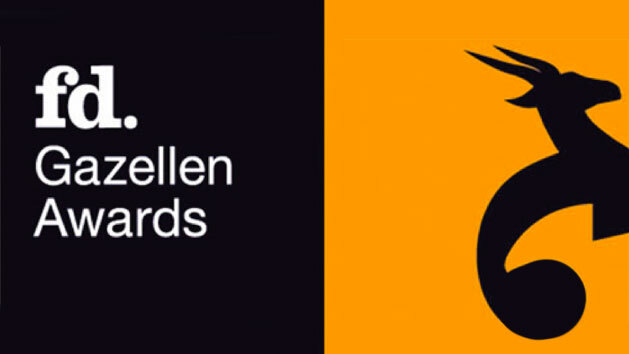 BV was named a real ‘Entrepreneur’s hero’ by Het Financieele Dagblad in 2015. We received the prestigious FD Gazelles Award and were thus among the fastest-growing companies of the Netherlands in 2015. This shows that we are sharp, innovative, implement the latest capabilities within each channel as quickly as possible within the company, and have the will to constantly grow every year. 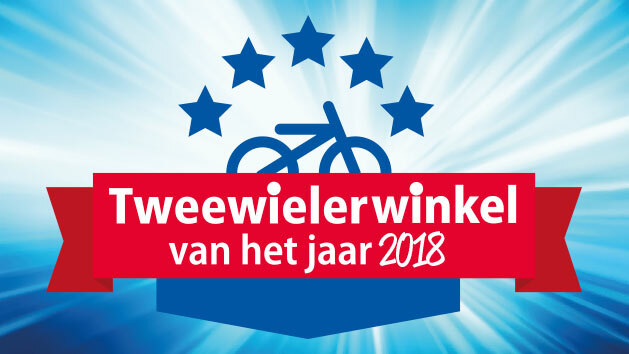 Our bicycle shop Giga-Bikes in Tilburg was nominated last year for the Bike Shop of the Year elections. Here we took first place in the municipal election of Tilburg. We are also the provincial winner of the province Noord-Brabant with an average score of 9.25 out of 10. An achievement we are proud of! 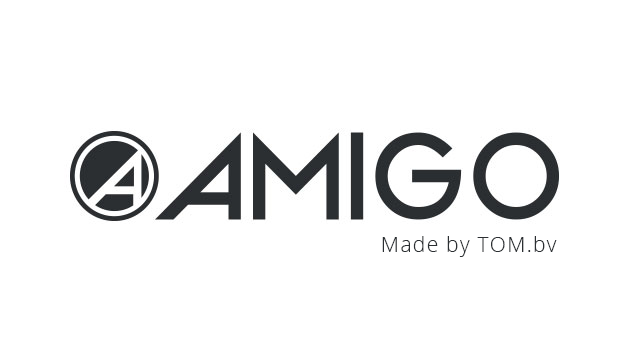 AMIGO is the own brand of T.O.M. bv. Under this brand we design and produce a unique collection of children’s bicycles as well as inner and outer tubes in all inch sizes. AMIGO stands for modern design with a very good price-performance ratio. The entire collection is designed and produced under the direction of T.O.M. bv. With this own brand, we can better respond to the wishes of consumers. 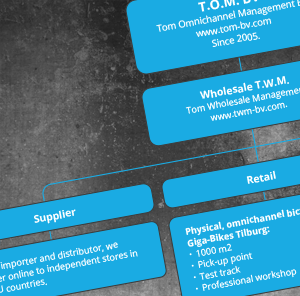 The Twinkle100 offers the ultimate overview of the largest online sellers in the Netherlands. On 20 September 2018, the 11th edition of the Twinkle100 was published by publisher BBP Media in Woerden. Twinkle’s editors are collaborating with the Centre for Market Insights (CMI) of the Hogeschool van Amsterdam for the research. The Twinkle100 2018 ranks the top 250 online retailers based on their Dutch internet turnover in the year 2017. T.O.M. bv finished 134th in the ranking. We have increased 39 places compared to last year. A good result! For 12,5 years one of the fastest growing companies in the Netherlands!